ThinkPad Tablet 2 is noticeably better than the previous version. Lenovo corrected the obvious flaws, kept the business feel, and improved this tablet in many ways. It looks really good, and the materials used in chassis construction leave the competition far behind. Like it or not, Windows 8 on a tablet is a liberating experience, particularly if you've ever felt boxed in by Android or iOS. Even if you haven't, Windows 8 tablets are kind of the Swiss Army knife of mobile computing -- they essentially run anything your Windows PC can; this provides an incredible amount of on-the-go flexibility that apps can't always deliver. At $580 on Amazon right now, it's certainly not a bad value for a Windows 8 Pro device either. The ThinkPad 2's performance and specs are so-so, but plenty adequate for most typical tablet uses. With passively-cooled Haswell chips and AMD's Temash on the way though, its Clover Trail innards are destined to become outclassed in the coming months. The Lenovo looks like a ThinkPad but, in several key departments, it doesn’t offer the quality we’ve come to expect from such a famous brand. The screen isn’t as bright or punchy as the Dell Latitude’s similarly-sized panel, the Lenovo isn’t quite as fast, and the Latitude has a flexible battery that lasts longer. It’s good, then, but not good enough to oust the Dell from the top of the business tablet pile. The build quality, specifications and performance of the ThinkPad Tablet 2 don't match its high price. The inclusion of a stylus makes Windows easier to manage and the battery life is better than faster Windows tablets. But it’s not enough to warrant any recommendation. Lenovo may have created a product with the looks of a top-class ThinkPad, but we’re not convinced it’s good enough to clinch our business tablet top spot. Granted, it’s sleek, attractive, and the docking stylus is a boon, but with Dell’s Atom-powered tablet delivering a much brighter screen, not to mention the flexibility of a replaceable battery, Lenovo’s ThinkPad Tablet 2 doesn’t quite have what it takes. While the unit is not well suited for demanding applications, it has ample power for running Microsoft Office, email, and web browsing, and so would make a fine alternative to a laptop or a consumer tablet like the iPad for specific workplace usage scenarios. The Lenovo ThinkPad Tablet 2 was the company’s attempt to create a new version of their original tablet equipped with Windows 8, but unfortunately, its specs and its overall experience gave us the feeling of a low-budget tablet, even though this particular tablet we reviewed is priced at $729, and that’s without including the price of its accessories like its low-quality keyboard. What the Tablet 2 does have going for it is its battery life, as long as you don’t consider its long battery charge time, and its lightweight build. 1.30lbs feels extremely light in your hands, and when you consider it’ll last 10 hours if it’s constantly on, that makes this tablet extremely transportable. 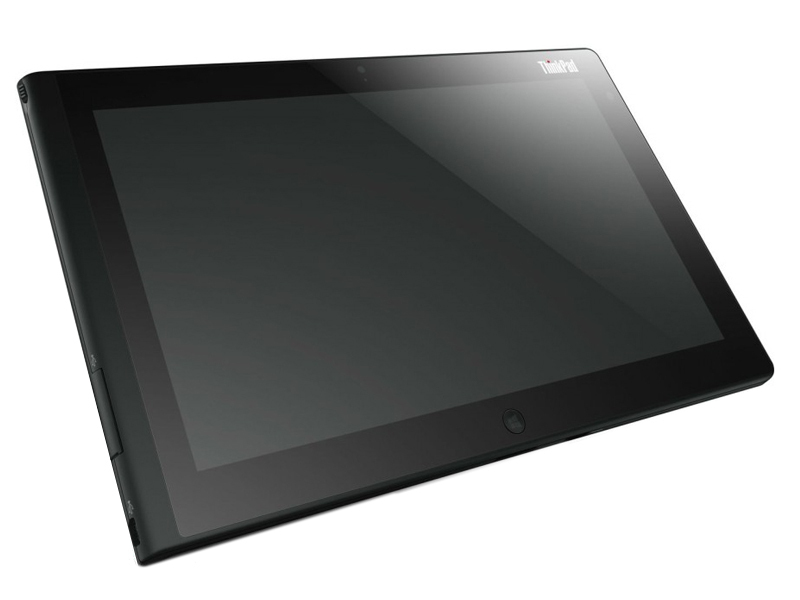 The Lenovo ThinkPad Tablet 2 is fantastic device when used as a casual tablet or business PC for a mobile sales force. The machine looks great, it's light and easy to hold, and the battery lasts all day. Users who simply want to browse the web or run basic productivity applications will be best served by this hybrid tablet, but those users also probably won't need a $740 Windows 8 machine either. The ThinkPad Tablet 2 targets an audience that wants more productivity options that what an iPad or Windows 7 netbook offer. However, with the machine's limited Intel Atom processor and integrated graphics, the device struggles to take full advantage of everything Windows 8 has to offer. Additionally, users who do not opt for the $120 keyboard dock will find the device's productivity greatly hindered. The Lenovo ThinkPad Tablet 2 is a decent Windows 8 Slate tablet. It doesn't win any of the performance tests, but is competitive with its Atom-powered rivals. It's a simple work-based tablet that has a good set of ThinkPad accessories that make it a good fit if you're transitioning ThinkPad users to something a lot more portable. However, for the ultimate in battery life, other systems like the Editors' Choice Dell Latitude 10 and keyboard docking tablets like the Acer Iconia Tab W510 are better choices if battery life is paramount. And let's face it, you're looking at an Atom-based tablet because of its combination of Windows 8 Pro compatibility and phenomenal battery life, right? The Lenovo ThinkPad Tablet 2 starts at $579 with the Atom processor, 32GB of storage, and no stylus but is probably sold out in most places like Lenovo’s online store. Then the 64GB model bumps up to $679 but you also get that stylus, and lastly you’ll be entering the $900 range for 3G/4G connectivity — something we feel should be much cheaper to integrate. For those comfortable with Windows 8 who needs the full PC experience without compromise, yet still in a sleek and lightweight portable option the Tablet 2 should be near the top of the list. Add the usual ThinkPad elegance and this is aimed to please. If you were looking for a good alternative to the Surface Pro, this certainly is it. Get it today and enjoy the rest of the photos below. Positive: Good degisn; good brightness and viewing angle of the display. good camera; good accessories; good connectivity; long battery life. Negative: Low resolution of the screen; slightly weak performance. Positive: Very good assembly; lots of connectors and ports. Negative: Glossy display. Positive: Low weight; nice rubberized surface; Integrated pen. Negative: Slow charging; high consumption in sleep mode. Model: Lenovo brings improvements since the launch of the first generation business-ready ThinkPad Tablets. The current generation, the Lenovo ThinkPad Tablet 2, is ultra slim at only 9.8 mm and 595 g. Its black polycarbonate case with soft touch feel makes it appealing to anyone looking for a high-end business tablet. The Windows 8 system features an anti-reflective 10.1 inch HD LED Backlit IPS display with 720p resolution, which supports five finger touch input. Considering that the tablet is a low-powered Windows 8 tablet, it performs quite well with the Intel Atom Z2760 dual core processor clocked at 1.8 GHz and 2 GB of RAM. Full HD video playback is possible with this tablet as it is equipped with an Intel Integrated HD SGX545 GFx. In addition, it features a 2 MP front camera, an 8 MP rear camera, a dual-array Digital Mic with noise cancellation, and stereo speakers. The primary storage device, a 64 GB SSD, is quite small. Since the tablet is expected to run for 10 hours when fully charged, it can be considered to be sufficient for day-to-day usage. This tablet also comes standard with one USB 2.0 port, a docking port, a mini-HDMI, a microSD slot, Bluetooth 4.0, GPS receiver, and a headphone/microphone jack. 72.64%: This rating is bad. Most notebooks are better rated. This is not a recommendation for purchase.